Faction boasts a leading film media production company with roots in necessity as much as strategy. At the beginning of their journey they could not afford to buy a slot with the big ski film production companies, so they turned to new technology like drones and rider-held steady cams and made up for what the lacked in budget with creativity. The down to earth approach bolstered by some of the best skiers in the world was a change and an irresistible movement. Last season with their first full-length feature film ‘THIS IS HOME,’ Faction’s 300-stop, 32-country film tour filling 1,800-capacity cinemas to universities had the most stops of any ski film tour, and with 1m digital views, it reached people at home as well. This season’s much anticipated three-part ‘The Faction Collective Presents’ series includes La Grave featuring Sam Anthamatten and Johnny Collinson and Olympic and X-Game women feature in a special series focused on women. Their next blockbuster is already in production for autumn 2019 launch in cinemas. On top of that formidable cast, Faction has partnered with Candide Thovex as a shareholder, athlete and director. Known as the G.O.A.T. – Greatest of All Time, Candide’s creative productions have generated over 100 m views withOne of Those Daysand Ski the World, and an audience of 1.5m Facebook & Instagram followers. His seven Cannes Lion Awards demonstrates his immense marketing talent as well as his cat-like skiing grace. Trainer brands and artists have collaborated with one another for decades (so called “Sneakerheads”). They embrace a cross-cultural vibe that is seen and felt in the adoring queues in Shoreditch for limited edition launches. As part of their DNA of keeping things fresh, Faction doesn’t let skis retain the dated style of the bigger brands, which were mostly founded between 1935 and 1954 and reflect that era of general brand positioning today. Taking inspiration from the sneaker and fashion collaborations, Faction focuses on artist and core brand collaborations beyond skiing. One such example is Faction teaming up with Dragon Alliance, leading eyewear and accessories brand, and their sensational edgy skate- and snowboard-focused Japanese artist Kengo Kimura in order to produce a collaborative limited-edition capsule collection featuring the Faction Prodigy 3.0 and Dragon X2 goggles. In March 2018, Faction released simultaneously online 200 limited Edition CT 5.0 skis and in 21 hand-picked shops worldwide. Within 36 hours they sold out, despite traditional shops saying that nobody wanted a 122mm ski. Candide Thovex’s has his own signature Faction skis, which are for performance, from park-specific to all-mountain skis, to backcountry freestyle inspired skis; his series has mixed materials, shapes, and camber lines to create his ultimate ski in each discipline. In December, Faction is launching The Collective Box, a new subscription box giving fans a way to represent the brand throughout the year, with a surprise selection of handpicked goods from Faction and associated brands. The boxes will feature soft goods, accessories, and eyewear not just from Faction but also fellow spirited brands like Pitviper and Dragon. Each box is unique and contains a potentially prize-winning golden ticket, with a one in five chance to win big prizes like a pair of new Faction skis. Faction builds the best skis for the most dedicated skiers and does not believe women have different requirements. Therefore, the brand has introduced the X series with the ‘X’ standing for the women’s X chromosome; the skis have the same tech, flex, and materials as men’s skis, but with some new lengths. 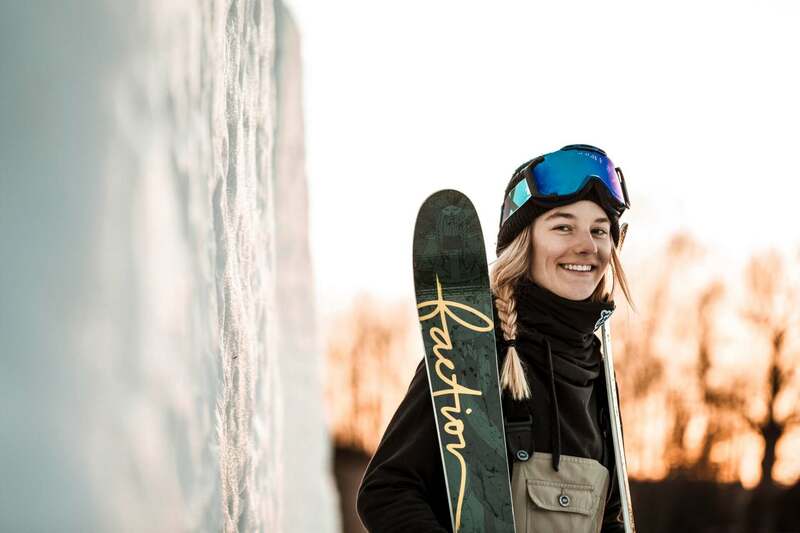 Seven of 23 finalists in the women’s slopestyle competition in South Korea rode Factions including gold and silver medalists, Sarah Hoefflin and Mathilde Gremaud. Faction also produces and sells Roxy skis for Quiksilver, which is testament to their quality; global brands have taken notice of Faction’s excellence. This season Faction products will be stocked in more than 50 premium retail stores across Japan, where demand is ever increasing. The Chinese ski industry has also been rapidly expanding, making it the biggest growth driver for the ski industry globally. Faction is already established as an aspirational brand in the Chinese market, the first AFP-sanctioned (Association of Freeskiing Professionals) freeski competition in China was co-sponsored by Faction and won by Faction Olympian Alex Hall. The Chinese skiing boom has already fuelled the construction of more than 700 domestic indoor and outdoor ski resorts. In the lead up to the 2022 Beijing Winter Olympics, President Xi Jinping has stated his intention of 20% growth in skiers each year reaching over 100 million by the Games, and 300 million skiers by 2030. The Prime Series is what results when you put a design engineer in a room with Freeride World Tour (FWT) athlete and mountain guide Sam Anthamatten. Armed with a pen and a blank sheet of paper, together they created their ultimate ski. Sam was searching for the Holy Grail for the growing ski touring market – the progressive flat tail ski that is light enough to tour up 1,500km, but burly enough to rip lines skiing down. With that objective in mind, a lightweight tourable big mountain ski was born that is secure and stable in all conditions and is the true definition of its name ‘prime,’ the first of its kind, from which all others derive. The Dictator Series boasts the second classic freeride flat tail ski launch this season, reimagined and rebooted into the 21st century to support the high growth free touring, freeride and increasingly discerning premium rental markets. Faction’s sales are currently 85% twin-tips which are 11% of the overall market, but the new flat-tail freeride and all-mountain ranges offer a growth opportunity to comfortably triple Faction’s sales. TURNING LUXURY INTO CHARITY Over €45,000 raised at a spectacular event! ONLY 80 TICKETS LEFT! Fifth Edition 2019 Club Vivanova Luxury Lifestyle Gala – Hurry!